Can’t Get Enough Human Sacrifices | SPACE-BIFF! The demonologist's monthly report on incoming sacrifices. 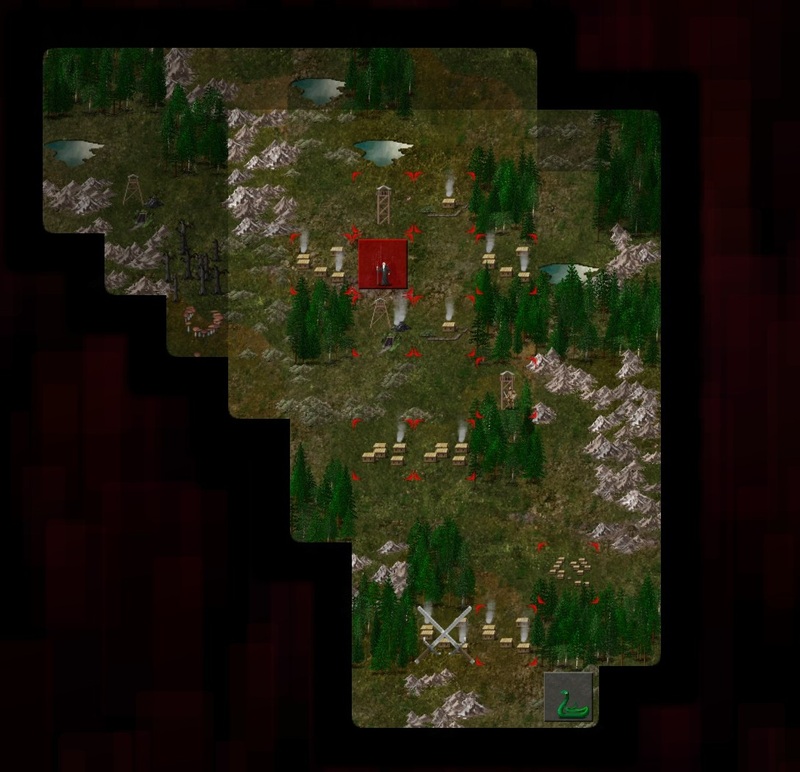 I’ve recently been playing a lot of Conquest of Elysium 3, the new game from Illwinter Game Design, who you might recognize as the creators of Dominions 3. My review is here, and last time I played as a halfling Burgmeister. Today I’m playing as the Demonologist, a mage willing to conspire with devils in order to gain atrocious power. It isn’t easy being a Demonologist, even if you have learned the dark arts of sacrificing your fellow man to appease the dark gods. No matter how powerful you become, there will always be a demon lord unwilling to join forces once you’ve summoned him into Elysium. And when that happens, not only does the ungrateful spawn refuse to join you, but you’ve got to fight it, further weakening your hellish army. Oh well. Next time you’ll have to sate the demon’s lusts with a few extra human sacrifices. A Demonologist surveys the beginnings of his dark empire. As I’ve mentioned before, each of the 17 classes in Conquest of Elysium 3 are unique. For the Demonologist, finding people to sacrifice is at the heart of everything he does. Unlike the Burgmeister, who searches for farms to turn into Weed-growing Hoburg Villages, the Demonologist isn’t particularly interested in locations that have such a small population. Instead, he’s looking for towns and hamlets and cities—anywhere that has enough people living in proximity that they’ll be willing to delay his wrath by handing over their outcasts every month. The Demonologist decides to take a risk by making only a small sacrifice. 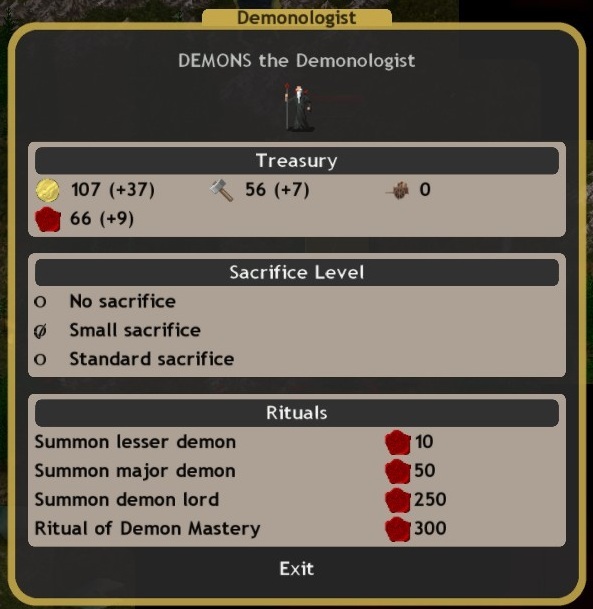 Once he’s gathered these sacrifices (and stored them in his ebony citadel, or another similarly ominous structure), the Demonologist can choose to sacrifice a chunk of them to call demons to his service. Now, this only accounts for the calling of the demon. If the demon is displeased with the number of people sacrificed to call it, or if it feels his new master is a wimp, it just might decide that it’s better off on its own. At which point, you’ll have to fight it. A Demonologist who has finally amassed a goodly number of hellhounds, demon knights, and other assorted monstrosities. The easiest way to avoid fighting the creatures you’re summoning—all of which are quite powerful—is to make a full sacrifice. This might make you wonder why anyone would ever sacrifice less than the standard amount. Surely such a man is insane! Well, it becomes pretty tempting to double your number of summoning rituals when you see a massive enemy army making a beeline towards your citadel. Unlike the Hoburgs’ cheap animal summons, the Demonologist will get at best a handful of demons out of each ritual. Sometimes he’ll get an imp or two. Choosing to make a small sacrifice may greatly increase the danger of the ritual, but it also cuts the cost in half. I imagine most Demonologists begin with rules—never make half sacrifices!—and are performing increasingly risky rituals after a few hard winters. Tuchulcha the Goat Sun, a demon lord pledged to serve my Demonologist. In my most recent game as a Demonologist, I had slowly gained ground, capturing a number of smaller towns and eventually a small city. The sacrifices provided by these locations fueled my expansion. Soon I controlled half the continent, and was locked in a struggle with Androdaira the Witch, who had grown every bit as powerful. Androdaira had the advantage of numbers. She fielded a pile of armies, letting her conquer my towns whenever I moved out to face her. She’d skirt around my invincible but slow army, damaging my income by dribs and drabs. It was apparent that I needed a second large army (I say “large” because I had plenty of smaller forces that acted as explorers or bandit-killers) so that I could maneuver at her from two directions and trap her. And the best way to begin building a second army was to summon a demon lord. The problem was that this was my most expensive ritual, and would cost 500 sacrifices—an immense sum that would leave me unable to perform any other summonings for quite a while. One of Androdaira's armies (top) faces off against my main army (bottom). A couple game years earlier I had tried to summon a demon lord at half cost, and had paid for my insolence with the destruction of over half of my army. I was planning on paying full price for the ritual this time, but I found myself unable to go through with it. Instead, I switched the options to “small ritual” and hit “summon demon lord,” half-expecting to lose the game because I couldn’t fathom spending so many sacrifices at once. To my amazement, it worked. 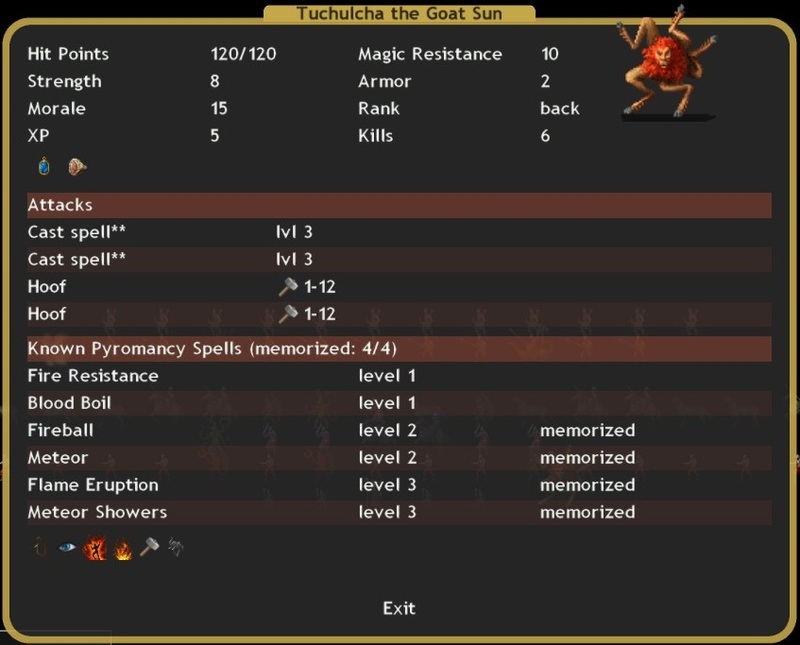 I successfully summoned and controlled Tuchulcha the Goat Sun. This huge creature commanded powerful magics, and was more than capable of leading an army. I used my remaining sacrifices to summon a mess of demons for Tuchulcha, and the two of us went out hunting for the Witch. Tuchulcha obliterates all but two of the enemy army with one spell. With two demonic armies it was a short hunt. We cornered her final army and converged on her position with both my Demonologist and Tuchulcha. Her troops fired first (as they were defending), but they could do little to my armored demon knights. Then our round came, and something appropriately horrible happened. 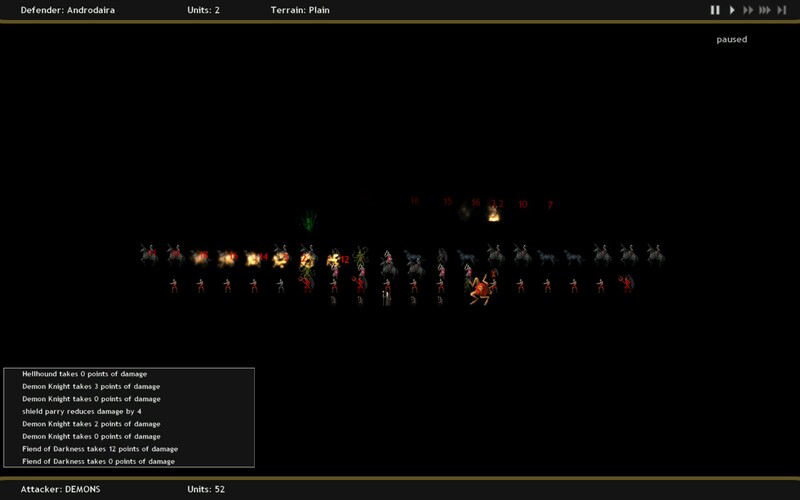 Tuchulcha obliterates both armies with a single spell. Including the Demonologist. I was dead, slain by a meteor shower that was brought down on both sides by Tuchulcha. The Witch was dead and my faction had technically won, but it wasn’t me who ruled. It seems an appropriate ending for a miserly Demonologist. Lesson learned: always pay sufficient blood for your demon lords. Posted on March 9, 2012, in Indie and tagged Conquest of Elysium 3, Illwinter Game Design, Indie. Bookmark the permalink. 4 Comments. That is a spectacular ending. Pingback: Conquest of Elysium 3 is… « SPACE-BIFF!